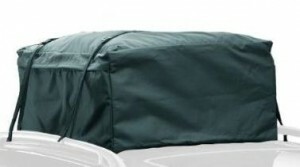 The Lund 601016 Soft Pack Roof Top Bag easily attaches to your vehicle’s roof rack. Web straps attach quickly, eliminating the need for drilling. The bag is made of water-repellent nylon and polyester to help keep out moisture. The full-length 2-way zippers allow easy access to your cargo. Although it has a large capacity of 13 cubic feet, this cargo bag is actually lightweight and can fold to a compact size when not in use. This bag is truly useful for road trips or camping adventures with friends and family. The Lund 601016 Soft Pack Roof Top Bag has collected 119 customer reviews on Amazon.com. Most reviews are positive, with customers praising the product for its generous space and the convenience it provides. Not very good at keeping your things dry – Some customers advise against using this bag during heavy rainfall. The manufacturer advertises this product as water repellant but not exactly waterproof. It might keep your stuff dry during light rains, but not during more severe weather. Poor material – A number of reviewers complained that the cargo bag is made of flimsy materials. More than a handful of Amazon reviewers reported that their bags have ripped or have shred to pieces after using it just a few times. Not for cars without a roof rack – Although the manufacturer claims that this product can be used without a roof rack, some reviewers report that this is simply not true. Attaching it to a car without a top rack will result in the bag flying off the roof when you start driving your vehicle at speeds more than 30 mph. Easy installation and use – The cargo bag was practically effortless to install. It’s easy to use and even easier to fold away and store. Weatherproof – Opposite to what some users reported, plenty of customers claim that this cargo bag was actually effective at keeping their items dry even through torrential rains. Holds a lot of stuff – Most customers were also pleased with the amount of space this cargo bag offered. One customer even reported that their family of 6 was able to fit their entire luggage in the bag without problems. While there is plenty of positive feedback for this product, complaints about the product’s durability are a little too many to be ignored. It seems that the material it is made of tends to tear or shred easily. It looks like this product is only ideal for use when you are carrying a light load and only when you don’t expect to be driving through very hot or very rainy weather.